Classic concerts given by Richter in Warsaw in 1982 in honour of one of his favourite composer-collaborators. Sviatoslav Richter was a great advocate of the music of Karol Szymanowski. Not only did it appeal to his temperament, but Szymanowski had been a cousin and close friend of his teacher Heinrich Neuhaus, who played the premiere of Szymanowski�s Masques. 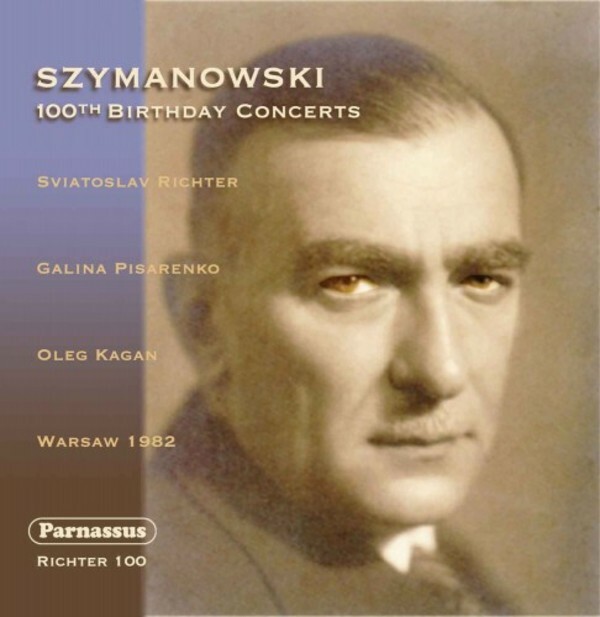 In 1982, to commemorate the 100th anniversary of Szymanowski�s birth, Richter put together two complete concerts of Szymanowski�s music. He was joined by soprano Galina Pisarenko in two of Szymanowski�s song cycles and by violinist Oleg Kagan in Szymanowski�s Mythes. Pisarenko and Kagan were both valued colleagues who performed with Richter many times. For these concerts Richter revived works he had played previously and added the two song cycles, two Mazurkas, and the Sonata No. 3 to his repertoire. Although the pair of concerts was given in several locations, it was apparently recorded professionally only once, in Warsaw, by Polish Radio. Through an arrangement with Polish Radio, Parnassus has now published a two-disc set including both concerts, recorded on November 25/6, 1982. The recordings are of fine professional quality and convey the virtuosity and color of Richter�s playing at their best.